DK, formerly known as Dorling Kindersley, is a British multinational publishing company specialising in illustrated reference books for adults and children in 62 languages. It is an imprint of Penguin Random House, a subsidiary of German media conglomerate Bertelsmann and British publishing company Pearson plc. Established in 1974, DK publishes a range of titles in genres including travel (including Eyewitness Travel Guides), arts and crafts, business, history, cooking, gaming, gardening, health and fitness, natural history, parenting, science and reference. They also publish books for children, toddlers and babies, covering such topics as history, the human body, animals and activities, as well as licensed properties such as LEGO, Disney and DeLiSo, licensor of the toy Sophie la Girafe. DK has offices in New York, Melbourne, London, Munich, New Delhi and Toronto. DK was founded as a book-packaging company by Christopher Dorling and Peter Kindersley in London in 1974, and in 1982 moved into publishing. The first book published under the DK name was a First Aid Manual for the British voluntary medical services; this book established the company's distinctive visual style of copiously illustrated text on a glossy white background. DK Inc. began publishing in the United States in 1991. That same year, Microsoft bought a 26 percent stake in DK. In 1999 it overestimated the market for Star Wars books and was left with millions of unsold copies, resulting in crippling debt. As a direct result, DK was taken over the following year by the Pearson plc media company and made part of Penguin Group, which also owned the Penguin Books label. DK has continued to sell Star Wars books after the takeover. In 2013 Bertelsmann and Pearson completed a merger to form Penguin Random House. Bertelsmann owns 53% and Pearson 47% of the company. Penguin's trade publishing activity continued to include DK under the newly formed Penguin Random House. 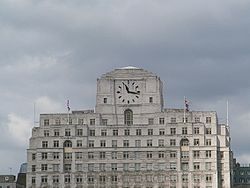 DK's London office is at Shell Mex House, 80 Strand, a 1930s Art Deco building easily recognisable from the River Thames by its distinctive clock. DK publishes a range of titles internationally for adults and children. Most of the company's books are produced by teams of editors and designers who work with freelance writers and illustrators. Some are endorsed by "imprimaturs": well-known and respected organisations such as the British Medical Association, the Royal Horticultural Society and the British Red Cross. Some DK books apparently produced by celebrity authors such as Carol Vorderman are actually ghostwritten by the company's own writers and editors. BradyGames is a publishing company in the United States operating as a DK imprint, which specializes in video game strategy guides, covering multiple video game platforms. It published their first strategy guide in November 1993 as a division of MacMillan Computer Publishing. In 1998, Simon & Schuster (which acquired Macmillan in 1994) divested BradyGames as part of its educational division to Pearson plc. BradyGames has grown to publish roughly 90-100 guides per year. On 1 June 2015, BradyGames merged with Prima Games, and future strategy guides made by the publishing company will be published under the Prima Games label. During the 1990s, the company published educational videos and a successful range of educational CD-ROMs under the brand DK Multimedia. During the late 1990s CD-ROMs were rebranded as DK Interactive Learning to reflect a changed emphasis toward the educational sector. Following dwindling sales and increasing competition from websites, the company tried to rebrand the digital part of its business as DK Online before opting to sell the UK publishing rights to its CD-ROM backlist in 2000 to an entirely separate company, Global Software Publishing, which is part of the Avanquest Software Group. The DK Online section of the business then transferred into development work on the anglicised version of the Pearson Education (US) KnowledgeBox product. In December 2010 DK opened an app store, selling digital versions of some of its books as well as products from other publishers. DK commenced publishing books aimed at teens with the release of Heads Up Psychology in May 2014 and further titles following every two to three months. Reception of the first title was favorable with Publishers Weekly writing "Attention-getting headers ("Why do good people do bad things?" introduces a discussion of the human capacity for evil) should hook curious readers, while the findings of psychological studies should deepen their understanding of this field. Infographics, sidebars, and photos both create an inviting visual layout and underscore the concepts discussed." while Booklist called it an "attractive book" and "a busy but appealing companion for high-school psychology textbooks." ^ "DK UK - Publishers of Award Winning Information - DK.com". dkbooks. ^ a b "About DK". dkbooks. ^ "Microsoft Corp acquires a minority stake in Dorling Kindersley Ltd". Thomson Financial. 1991-03-18. Archived from the original on 2009-08-03. Retrieved 2008-10-30. ^ "Star Wars book flop hits DK". www.bbc.co.uk. BBC. 24 January 2000. Retrieved 17 October 2015. ^ Charles Goldsmith (3 April 2000). "Media Giant Pearson Acquires U.K. Publisher Dorling Kindersley". The Wall Street Journal. Dow Jones & Company, Inc. Retrieved 17 October 2015. ^ Press, The Associated (4 July 1998). "Pearson Revises Simon & Schuster Deal" – via NYTimes.com. ^ "Two big video game strategy guide makers become one". Polygon. Retrieved 2015-06-02. ^ James Quinn (12 December 2010). "Dorling Kindersley opens its own app shop". The Telegraph. Retrieved 17 October 2015. ^ Stuart Dredge (8 September 2011). "Dorling Kindersley talks iPad, Android and its 'Darwinian' apps strategy". The Guardian. Guardian News and Media Limited. Retrieved 2 August 2016. ^ Sally Lodge (29 April 2014). "DK Enters the Teen Market with Nonfiction Line". www.publishersweekly.com. PWxyz LLC. Retrieved 17 October 2015. ^ "Heads Up Psychology". www.publishersweekly.com. PWxyz LLC. Retrieved 17 October 2015. ^ "Heads up psychology". www.buffalolib.org. Buffalo & Eric County public Library. Retrieved 17 October 2015. ^ "Pocket Genius". PenguinRandomhouse.com. Retrieved 2018-07-27. ^ "DK UK | Publishers of Award Winning Information | DK.com". www.dk.com. Retrieved 2018-07-27. Wikimedia Commons has media related to Dorling Kindersley.